A scuba marker buoy is a key piece of gear that will ensure your safety when under water. If you are diving in water which is being used by a lot of people, then it is imperative that the people on the surface know you are underwater. 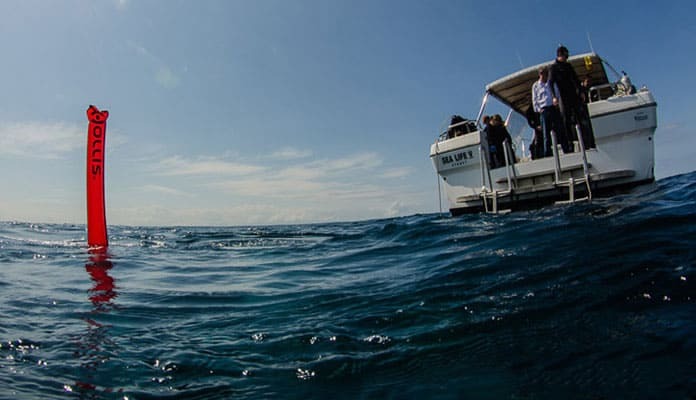 Hazards, such as boats passing overhead when you are surfacing, or divers diving in the same area, exist, and you should always have a safety-first mental when you are under the water. The best surface marker buoy will not weigh you down or inhibit your dive at all, but it will allow you to communicate where you are in the water. These dive markers give your party an idea of where to pick you up and how far you have drifted. The top-rated SMBs are easy to use and will inflate in seconds, allowing you to be safe, but also to enjoy your dive. It is important to find the best diving SMB so that you can properly enjoy your dive. The SMBs on our list will keep you safe when you are in the water. Here are our top 10 for 2018. This safety buoy is a must have for every diver, no matter their experience level. The compact design makes it easy to bring on every dive. The highly visible yellow color is easy for boats to see if you surface a distance away from your boat. Rolling up small enough to fit into a large pocket or easily strapped to your BCD, you won’t notice this SMB on you until you need it. Inflating to a large size, it is durable enough to face extreme weather conditions. With an easy to use oral inflation valve and a lock you will ensure your buoy is working well. A D-ring on top allows you to attach a light or strobe to the top for added visibility and security. For additional safety, there is even a second inflation option in case of emergency. This signal tube even comes with a two-year warranty. 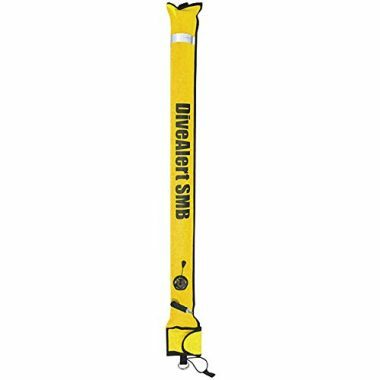 This dive marker compacts to fit into small dive bags but will unpack into a good size for being seen in the water. The color is bright and vibrant, ensuring that you will be seen in any water. The marker is inflated through a valve, and the valve is reinforced with steel to ensure that it does not break down under the strain of being used under the water. We like that there is a D-ring on this marker. You can easily connect it to your dive belt if you want to. There is also a pocket for a finger spool, so when you add one, you do not need to worry about finding a place to store more gear. Stay safe with the help of this lightweight scuba smb. 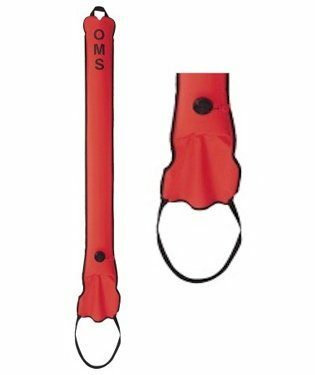 Coming equipped with detachable dive flags on both sides this personal float may just save your life. 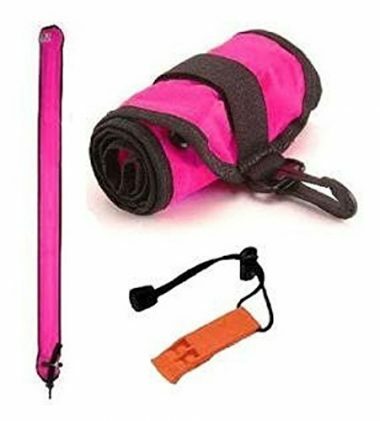 Its bright color is highly visible and can be easily seen even from a far distance. A large reflective strip allows you to be visible during the night as well. Easily inflated using an oral inflation valve and equipped with a dump valve allows this compact device to work easily. Made using an incredibly durable material and equipped with a one-year limited warranty, you can feel sure that you made a great purchase. 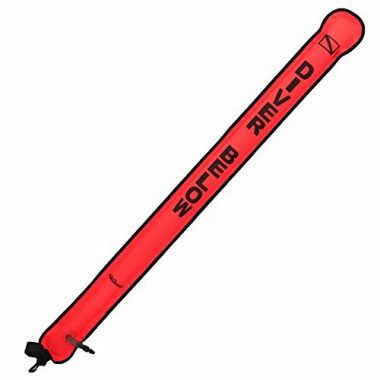 This is an extremely easy dive marker to inflate. Once you are in the water, you can purge your air to fill it, or you can capture the bubbles you exhale. You can inflate this marker quickly when you are in the water and get on with the fun parts of your dive. We love the orange and silver color on the marker. When combined with the reflectors, this is a dive marker which will be seen in all conditions. This dive maker is easy to inflate. There is a valve at the bottom of the SMB which is easy to use. You can quickly and easily inflate the marker without having to take up too much of your dive time. Once the air is in the marker, the valve will seal it in. We love that this marker comes with a safety whistle attached. If you are needing to be picked up, and are at the surface, then the whistle adds sound to the already visible device. 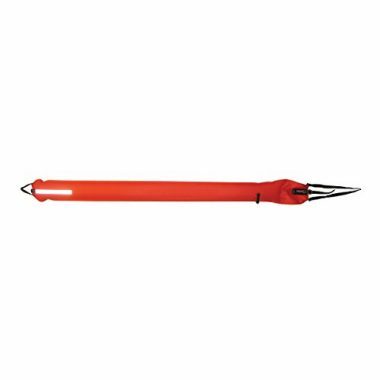 This surface marker is bright orange and will show up in any type of water. The close end allows the marker to stay inflated once you have inflated it, and the premium brass screw-down inflator makes it easy to inflate the marker when you are under the water. The valve will securely keep the air in, and the heavy-duty construction of the valve will ensure that it does not fail after constant use. The heavy-duty fabric will also last a long time. This is a well-made marker which is worth the investment. The XS Scuba Surface Marker will keep you safe when you’re underwater. A long 7 foot body will warn people of your location on the surface and give you a point of reference when diving. Features like large reflective tape, an extra loop for a light and a large stainless steel D-ring do their best to keep you safe and visible. This dive marker is an excellent choice for someone looking for a clean, neat package. 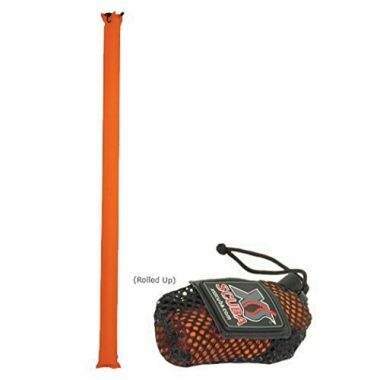 The 75-inch dive marker rolls up and fits into the included mesh bag with ease. 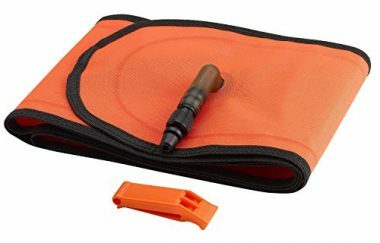 The included mouthpiece makes this easy to inflate and the snap clip gives you the option of attaching it to a line. 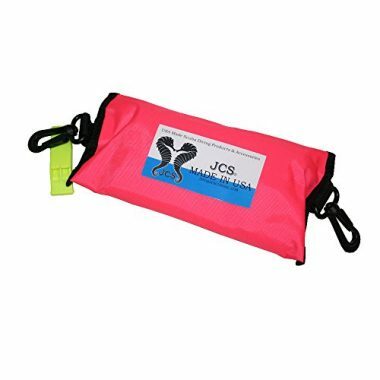 If you are diving in fast moving water this is a top pick and becomes a necessity for your safety. This Zeagle diving buoy is a piece of gear that should be with you at all times. Unlike most markers, this one can be inflated at depth. Simply hold open the valve and fill it with purged air and send it to the surface when inflated. Don’t worry about the pressure as it has a built in over pressure relief valve that ensures it gets to the surface. This is a great option for travel dives where you will be traveling a long distance allowing you to set it up where you find a place you want to explore further. 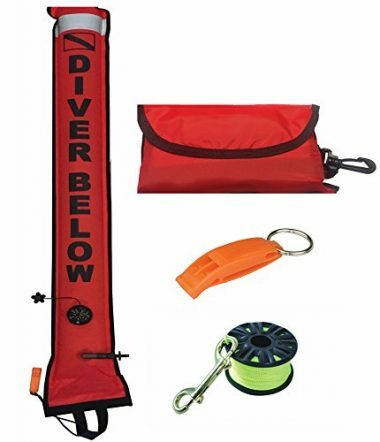 This dive marker folds up into a compact size and seals when not in use. When you want to use it, it unfolds into an impressive size and is then easy to fill. The open bottom makes it quick to fill with air, and when you come to deflate and pack up the marker, that is extremely easy to. This SMB is brighter and visible, and the included whistle adds more safety to the device. Dive marker buoy reviews will tell you that this is not just a product for beginners. It is an important accessory for every diver. 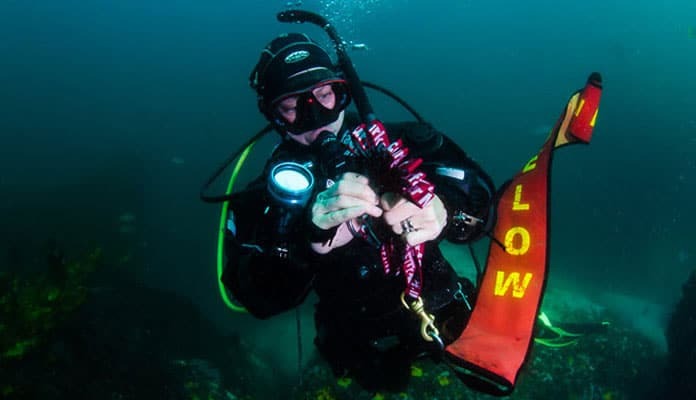 There are many things to consider when looking to purchase a dive marker. If people are going to be able to see you the dive marker will need to stand out. Most are a bright red or orange color with options for yellow or green. This will notify ships of your location and let them know you are underneath. Fluorescent strips also go a long way to signal your location, especially at night. Scuba diving requires enough gear as it is. This is why dive markers have been designed to roll into a compact bag. Being able to strap this to your bag will not only make you remember to bring it with you but also not take up crucial space in your pack. When they are inflated your marker should not be small and compact. Full sized markers will range in size from 4 to 8 feet in length and 4 to 12 inches in diameter. We find that 7 feet is the sweet spot. Anything smaller will be hard to see and anything bigger will add visibility but also bulk to carry. When you are looking at an SMB, you will notice that you have two options: closed and open-end. The two options are what you would expect from the name. The open-end SMBs have an open end. This makes them easier to inflate. The open end will have a weight to keep the open end under the water. If the end does breach the surface of the water, then the air will escape, but they are easier to use and inflate. They are also easier to deploy at depth, but may not be as visible when you do. Closed-end SMBs have a valve to keep the air in. Once they are inflated, they are easier to keep inflated. One thing we like about the open-end SMBs is that they are easy to inflate. You can use any source of inflation to put air into it, but one handy way to inflate them is to do so with your exhalation bubbles when you are in the water. You can exhale your bubbles directly into the dive marker and inflate it without another inflation device. For the closed SMB, you need to blow into the valve to inflate it. This generally involves taking in a breath through your regulator, taking the regulator out of your mouth, and then exhaling into the marker. They are trickier to inflate, especially at depth but will stay inflated when you have them inflated. You will find that SMBs will come in a variety of bright colors, with the main two colors being yellow and orange. The color should not be much of a choice when it comes to the actual color, but you should ensure that your dive marker can be seen. You would not want to use a dark colored marker in the ocean, and you would probably not want to use a bright blue marker in tropical waters. Sticking with yellow or orange is a safe choice for being spotted at distances. The line you need will depend on where you are launching your marker from. If you are five meters down and are launching your marker, then you would not want a long line, and a finger spool would be an adequate way to launch your marker. If you are down deep, then you will want a longer line and a better way to dispense the line. You may want to use a reel at depth. The other option is to use a weighted line. You drop the weight to unfurl the line, inflate the marker, and then launch the SMB. Depending on the currents and type of water you are diving in, you may want a line which is attached. If you use a finger spool or a reel, then you can follow the SMB as it goes to the surface. The other benefit of having a line attached to the SMB is that you or the SMB will not drift from each other. When the boat comes to the marker, the attachment will ensure that you are below the marker and have not drifted off. Q: What Is A SMB? A: An SMB is a surface marker buoy. An SMB is a piece of safety equipment for when you are diving. When you are under the water, you can launch an SMB to indicate your location or as part of a safety check. 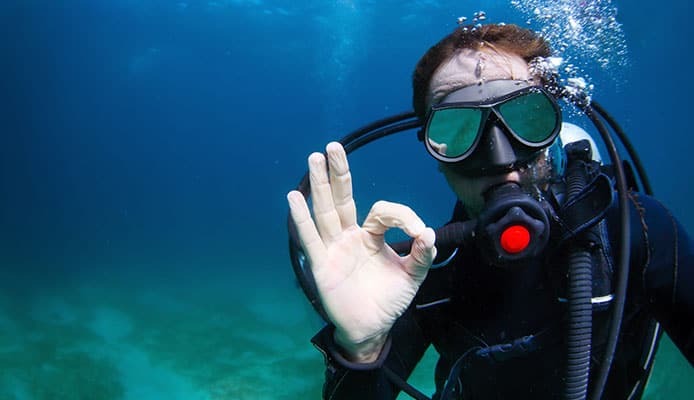 Your mask and your scuba equipment will help to keep you safe when you are diving, but another important safety precaution is to have an SMB with you. When you launch it, it helps to show other divers and boats where you are. It allows you to go deeper into the water without worrying about becoming separated from your dive boat. When you get to a point in the water where you need to perform a safety check, or if you want to place a marker so that people know your position, then you can launch your SMB. TO do this, you open your SMB and inflate it. You may have an inflation device which you can attach to it, or you could inflate it with your exhalations. This can be done in one of two ways. If you have an open end, then you can allow your air bubbles to be caught in the device. If there is a valve, then you will have to exhale directly into the device. Once you have filled the device, you can let it go, and it will float to the surface of the water. Q: Why Do I Need A SMB? 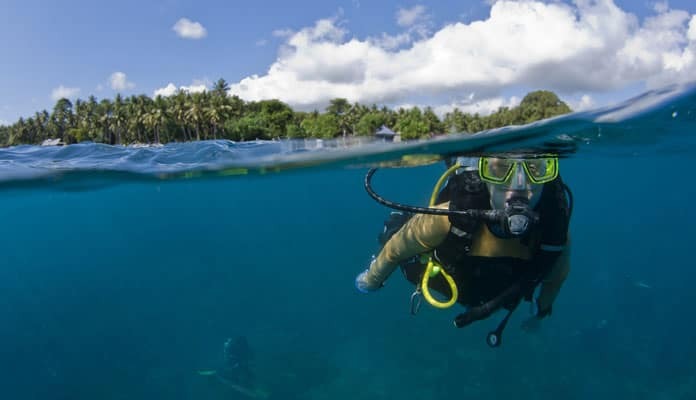 A: There are even some destinations where an SMB is mandatory for a diver. One of the biggest advantages that an SMB provides is not having other boats sailing over your position when you are coming back up to the surface. It can be dangerous to be completing your ascent when a boat sails straight through your position. An SMB will prevent that from happening. SMBs are a great way to communicate your position to other divers and boats. They allow you to be rescued easier if you get into trouble and they keep danger from getting in your way. Q: Open At The Bottom Or Self-Sealing SMB? A: The choice is entirely up to you. The open-bottom SMBs are easier to inflate, and you do not need to take your regulator out of your mouth to fill them. You will need to do a little more work with a closed-end SMB, but once they are inflated, they will stay inflated, and be easier to use. When exploring underwater, it is important that you have the proper safety features to keep your dive enjoyable while keeping you safe. Carrying a scuba marker buoy with you on every dive will keep you safe and visible while you are in the water. 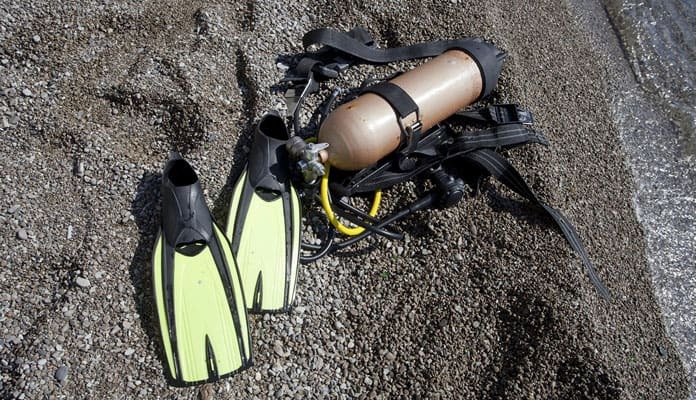 Even experienced divers use this to ensure that they enjoy their dive to the fullest. We try our best every day to stay safe, but the underwater world is a different kettle of fish. If you are not safe under the water, then you can be at serious risk of harm or even death. There are numerous safety devices which will keep you safe under the water, and an SMB is one which we would always recommend having with you at all times. Take the time to go through our buying guide and understand exactly what you need to look for in this safety device. An SMB is inexpensive, but it is a crucial part of your kit. 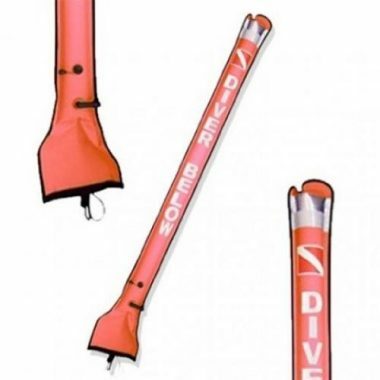 Do you own or use one of these dive markers? Let us know what you think in the comment section below.